Stop expensive habits like smoking, alcohol, eating out, gym membership, late fees, coffee, soda, lottery tickets, unused groceries, bottled water, out-of-network ATMs, and boating. Unplug unused electronic devices. Anything with a power brick – chargers, printers, etc – pulls electricity from the wall. Other machines with clocks, lights, or remote control sensors remain on, constantly powering themselves. Cook your dinners and packs your lunches. Simply bringing lunch from home four days a week over a career can save you over $141,000. See the Brown-Bag Savings Calculator for justification. Have free fun. Teach yourself and your children, fun is an experience not a commodity. Click here to get some ideas. Make frugal friends. The easiest way to be frugal is to hang around other people who are frugal. Watching people save inspires savings. 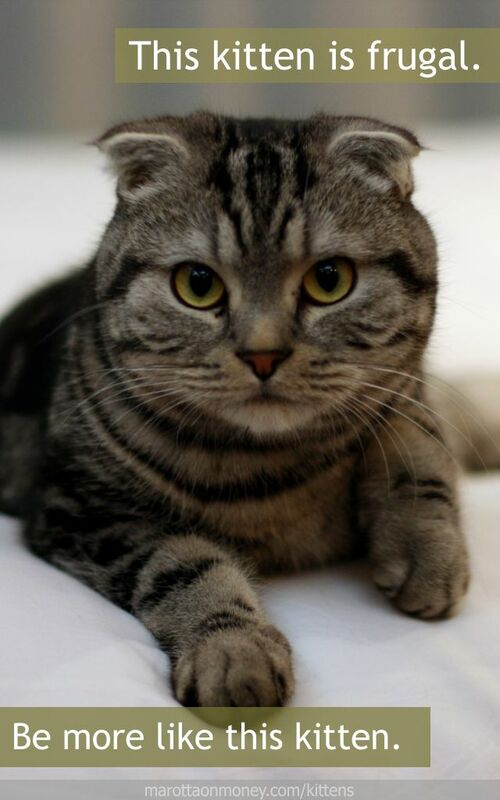 Photo of Scottish Fold taken by Tom Thai and used here under Flickr Creative Commons.